Water is the major element required by an individual for survival. The daily consumption of water from different sources exposes an individual to various elements present in water which can be either beneficial or harmful. The various parameters of drinking water are monitored on regular basis to ensure consumption of water with permissible limits of various elements present in the water. Fluoride ion in traces in drinking water helps in growth and development of healthy, resistant teeth, and bones. The concentration of fluoride in drinking water is one of the factors strongly influencing the dental caries situation globally. Fluoride levels are monitored in drinking water supplies to achieve the required safety. Knowledge of fluoride level in potable water is important for health-care personnel and policymakers. However, there are no studies on the level of fluoride in drinking water in Navi Mumbai. We therefore planned this study to determine the fluoride concentration in drinking water from five different residential sources in Navi Mumbai. The study also aimed at determining the fluoride content of the water at the dam which was the source of water supply to Navi Mumbai region and at the water purification plant. An in vitro analysis of fluoride level in collected drinking water samples from various parts of Navi Mumbai was done. The collection and analysis of water samples were carried out over a period of 1 month in March 2017. The study commenced after approval from the Institutional Ethics and Research Committee. Permission was also obtained from the Central Research Laboratory to utilize the facilities available for analysis of fluoride content in drinking water. The Navi Mumbai region is supplied by the water from the Morbe dam which is owned by the Navi Mumbai Municipal Corporation. It is a gravity dam on the Dhavari river near Khalapur, Raigad district in the state of Maharashtra, India. It can provide 450 MLD water, of which only 330 MLD is being utilized today. The water from the dam is purified at water purification plant situated in Bhokarpada, Raigad district. The water samples were collected from seven different locations of Navi Mumbai region. From each site, total five samples were collected to perform repeated analysis. First, five water samples were collected from the Morbe dam from where the water is supplied to Navi Mumbai. Five water samples were also collected from the water purification plant at Bhokarpada in Raigad district where the water is purified before supplying to the people residing in Navi Mumbai. 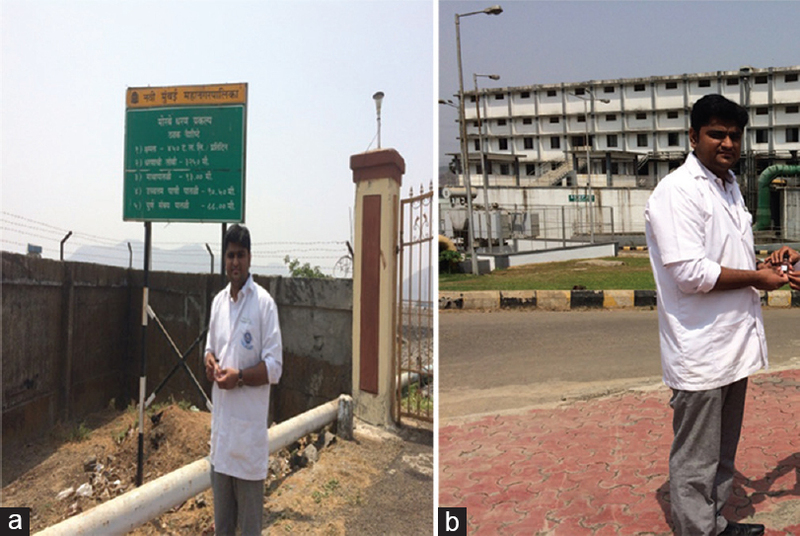 Finally, five drinking water samples were collected randomly from five different residential areas each of Navi Mumbai [Figure 1]a and [Figure 1]b. A total of 35 water samples were analyzed for fluoride content. The water samples from each site were collected in sterile glass jars and transported immediately to the Central Research Laboratory for analysis of fluoride levels in them. The drinking water collected from the residential areas was not allowed to pass through any filter before collection. Add eight drops of reagent 012B. Mix the contents and allow it to stand for 4–5 min. The developed color of the sample was compared with color comparator chart provided with the kit (HiMedia fluoride color chart for WT012). The color chart had readings from 0 ppm to 2.5 ppm (0, 0.5, 1.0, 1.5, 2.0, and 2.5 ppm). Each fluoride level had a separate color comparator represented on the chart. To eliminate bias, the samples were collected in a labeled sterile container. The labeling was done for seven different locations from A to G [Figure 3]. The collected data were entered and statistically analyzed using Statistical Package for the Social Sciences version 11.5 software (SPSS Inc., Chicago, IL, USA). The mean concentration of fluoride level in water samples from each site was calculated. It was observed that the mean concentration of fluoride level in water samples from dam, water purification plant, as well as the five random residential areas was 0.5 mg/L (1 mg/L = 1 ppm) [Figure 4] and [Table 1]. The mean concentration of fluoride level was calculated based on the comparison of final color of water samples after mixing with the reagents of HiMedia AQUACheck Fluoride Testing Kit-WT012 with the color comparator chart provided inside the kit. The fluoride level remained constant throughout from the source till the end consumer. The drinking water from the source underwent purification and distribution through pipes to the population of Navi Mumbai. During the entire process, the fluoride content of water remained unchanged. The purification and distribution process had no effect on the fluoride levels of the water. The current WHO guideline value for fluoride in drinking water is 1.5 mg/L (WHO, 2011). In temperate regions, where water intake is low, fluoride level up to 1.5 mg/L is acceptable. The Ministry of Health (MOH), Government of India (GOI), has prescribed 1.0 mg F/L and 2.0 mg F/L as the permissive and excessive limits, respectively. The in vitro analysis revealed that the mean concentration of fluoride level in water samples from dam and water purification plant as well as the five random residential areas was 0.5 mg/L, which was below the recommended levels by the WHO as well as the MOH, GOI. The in vitro analysis in this study was done using HiMedia AQUACheck Fluoride Testing Kit-WT012. To eliminate bias, the samples were collected in a labeled sterile container. The person performing the analysis for fluoride content was unaware of the source of water of the samples. Collections of five different samples from each site were done, and the mean concentration of fluoride content was calculated. It was ensured that the water from the same source was being tested at each site. This was done by ensuring that the residential areas did not receive water supply from private water suppliers on day of sample collection. There are few chemicals for which the contribution from drinking water to overall intake is an important factor in preventing disease. One example is the effect of fluoride in drinking water in protecting against dental caries. As per the WHO, the guideline value for fluoride content in drinking water is 1.5 mg/L (1500 μg/L). There is no evidence to suggest that the guideline value of 1.5 mg/L set in 1984 and reaffirmed in 1993 needs to be revised. Fluoride is usually determined by means of an ion-selective electrode. This study used HiMedia AQUACheck Fluoride Testing Kit-WT012 for analysis of fluoride content in samples of drinking water. This method is very simple, fast, and inexpensive depending on the color comparison with the standard chart provided in the kit. The readings present on the color chart were 0.0, 0.5, 1.0, 1.5, 2.0, and 2.5 ppm. The range is wide and sufficient to interpret the fluoride content in water sample related to its permissible and excessive concentration limits. 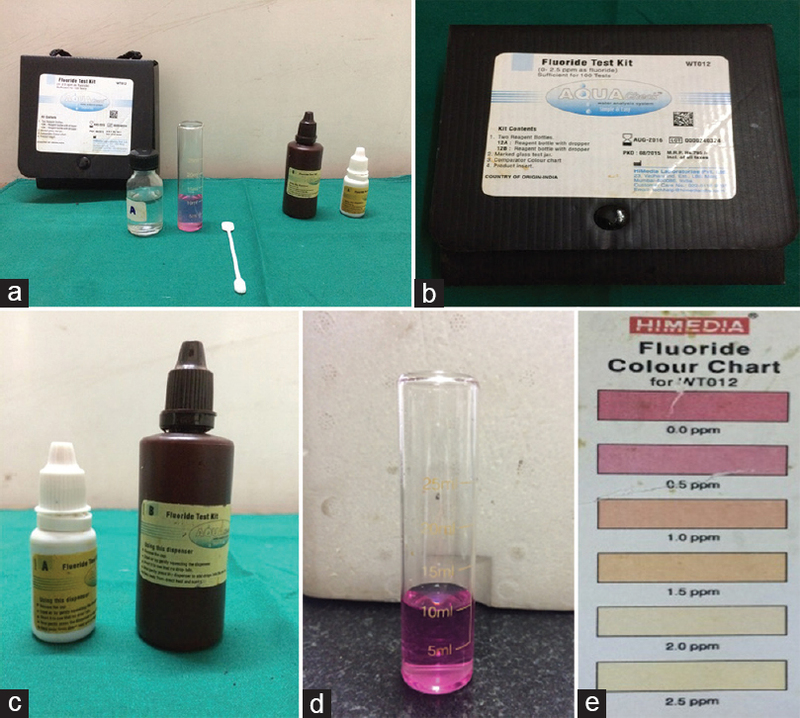 Further studies can be done to determine the fluoride levels in the drinking water samples from Navi Mumbai region using fluoride ion electrode and check for reliability of HiMedia AQUACheck Fluoride Testing Kit-WT012. In this study, it was observed that there was no effect of filtration process on fluoride content of water. The fluoride content before and after purification process at the purification plant remained constant. The effect of purification process at home was not determined in this study. Further studies can be planned in this direction, where the water samples can be collected from different RO filters at homes in random residential areas of Navi Mumbai. The water samples collected in this way after filtration will help us to determine whether these filters have any effect on the fluoride content of the water. The mean concentration of fluoride level in water samples from dam, water purification plant, as well as the five random residential areas was 0.5 mg/L. There was no effect on fluoride content of water samples of water purification process at the plant as well as of the distribution of purified water to residential areas. The observed fluoride level in drinking water from all the sources was less than that recommended by the WHO as well as the MOH, GOI. Chandio TA, Khan MN, Sarwar A. Fluoride estimation and its correlation with other physicochemical parameters in drinking water of some areas of Balochistan, Pakistan. Environ Monit Assess 2015;187:531. Amouei A, Mahvi AH, Mohammadi AA, Asgharnia HA, Fallah SH, Khafajeh AA. Fluoride concentration in potable ground water in rural area of Khaf City, Razavi Khorasan Province, Northeastern Iran. Int J Occup Environ Med 2012;3:201-3. Ayoob S, Gupta AK. Fluoride in drinking water: A review on the status and stress effects. Crit Rev Environ Sci Technol 2006;36:433-87. Meenakshi, Maheshwari RC. Fluoride in drinking water and its removal. J Hazard Mater 2006;137:456-63.
WHO. Guidelines for Drinking-Water Quality. 4th ed. Geneva: World Health Organization; 2006. Singh B, Gaur S, Garg VK. Fluoride in drinking water and human urine in Southern Haryana, India. J Hazard Mater 2007;144:147-51. Rajković MB, Novaković ID. Determination of fluoride content in drinking water and tea infusions using fluoride ion selective electrode. J Agric Sci 2007;52:155-68. Jagtap S, Yenkie MK, Labhsetwar N, Rayalu S. Fluoride in drinking water and defluoridation of water. Chem Rev 2012;112:2454-66. Physical Infrastructure – City and Industrial Development Corporation of Maharashtra. Available from: http://www.cidco.maharashtra.gov.in/NM_Physical_Infrastructure.aspx. [Last accessed on 2017 May 03]. Test N B-Sure Water Testing Kits by HiMedia Laboratories Pvt. Ltd. Available from: http://www.himedialabs.com/HML/images/literature/pdf/100000021/23.pdf. [Last accessed on 2017 May 03]. WHO. Guidelines for Drinking-Water Quality. 4th ed. Geneva: World Health Organization; 2011. Available from: http://www.apps.who.int/iris/bitstream/10665/44584/1/9789241548151_eng.pdf. [Last accessed on 2017 May 05]. ICMR (Indian Council of Medical research). New Delhi Manual of Standards of Quality of Drinking Water Supplies Special Report Series. No. 44; 1975.